The Darjeeling hill station story continues in this next chapter of Darjeeling travel diary. 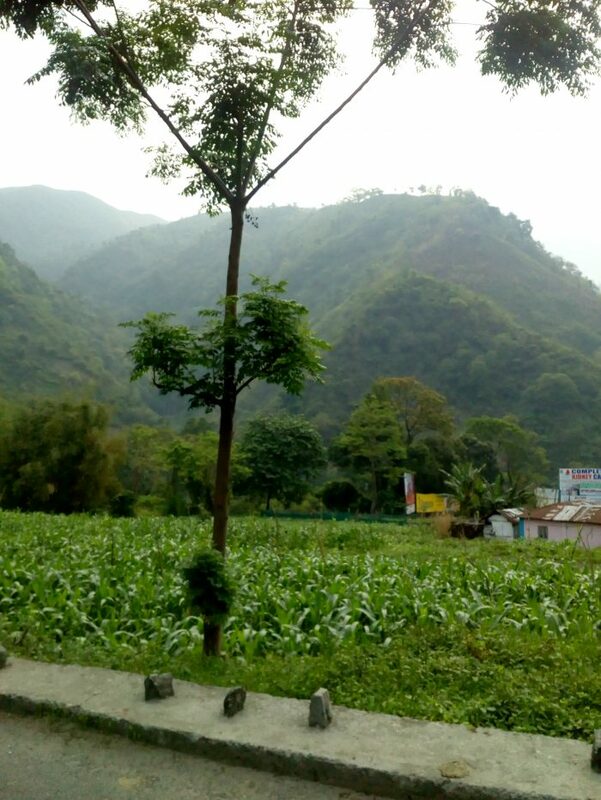 The City of Hills is a hidden paradise full of natural beauty and serenity all around. I could not sleep the first night because I had luggage to look after. But still, I was refreshed and all set to hit the road. Taxis were waiting in the parking lot of the station. You can simply go up to the drivers and ask around for one who is going to your location. I choose a guy who was decent looking but Ohh Boy! It took him about an hour to fill up the taxi. Then we finally started the long awaited journey. We drove through Military bases and it was unlike any experience I ever had. After driving through the military base, we started our ascent. I had never seen how a city on the hill looks. But once we started ascending, the sight was just “wow.” In the picture below you can see the road that we used to climb higher and higher into the hills. Just at the middle of the mountain we stopped and had breakfast. 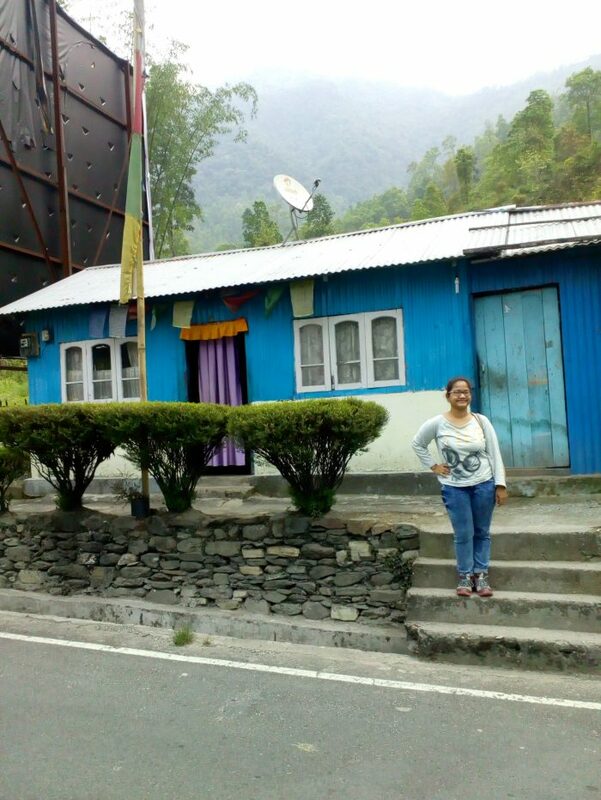 This was the first time I got a look at the wooden houses which are popular in Hill stations. The little Dhaba (hotel) where we had our breakfast in is in the picture below. Isn’t it cute? After breakfast, we ascended again, and reached, 6,700 ft above the ground level. The town of Darjeeling is dolled up for everyone to see, there are flower pots decorated in each and every house. Nothing looks prettier than the wooden houses adorned with varieties of flowers. I had kept my GPS on, so when I reached my hotel, I asked my driver to drop me there. All the taxis head to the Chowrastha or the Market area. But you can ask the driver to drop you at your hotel if it is on the way. After hours of sitting in a jam-packed car, it was hard for me to carry my luggage and climb to my hotel. 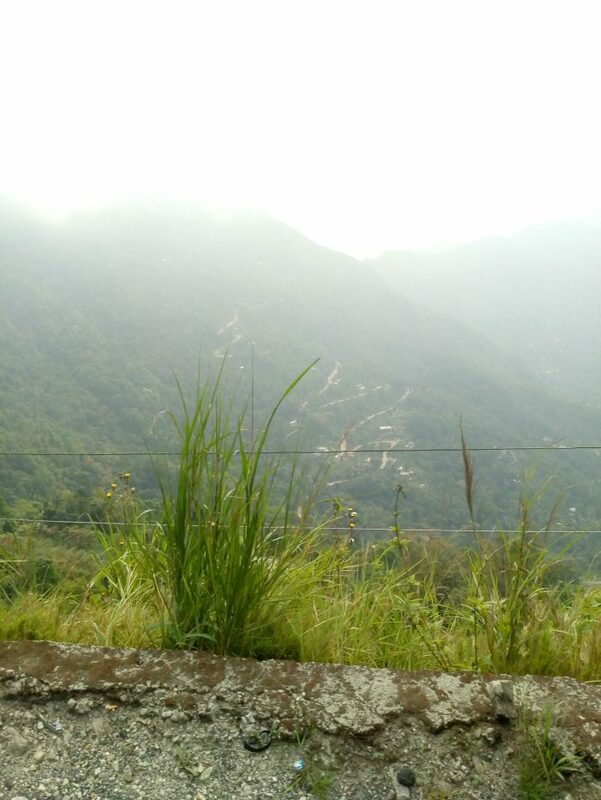 That is when I learned the first lesson of Hill Station tourism: you have to climb a lot. Climbing is like walking here. And those who don’t have strong legs will get toned legs if they live here for a month. I stayed at a homestay which I booked online. It was only my second online booking, so I had some doubts. But once I took a look at the hotel my hopes sunk. It wasn’t like I was expecting a 5-star, but I thought at least, no harm in looking for a hotel, right? I was told to wait, as my room wasn’t ready yet. Then walked in the owner, and I was struck by her beauty. Shoyeta introduced herself and asked if I would care for some coffee. My hopes were dashed, but a coffee sounded heavenly. As soon as I said yes to the coffee, the receptionist showed me to my room. And Oh-boy! I was totally wrong. My room gave me a spectacular view of the mountain ranges, and it was more than comfy. The tiny coffee mugs, with all the Sikkimese prints, looked beautiful. Day one in Darjeeling was uneventful by far, except the lucky room I got. In the afternoon though, I couldn’t sit still. I headed to the nearby Monastery – Dali. It was just a 5-minute walk from my hotel. At the time I visited, about 3:30 pm, there were no tourists around to block the views or photo bomb my pictures. Dali was empty, except for the massive furry giants moving everywhere. The dogs here may look scary, but they are harmless. I roamed free in the monastery, and also went to the prayer room. There was an old lady there who was adorable; she let me spin the giant cylinders in the room. On my way back, I sat in the coffee shop at the monastery. The coffee was from a coffee machine- nothing fancy. However, you get to sit in the open and have a stunning view of the Darjeeling town. After my coffee, I headed back from the Monastery. My next stop was the Chowrastha market. Even though it is summer in India, Darjeeling is unpredictable. One moment it will be all sunny and the next you see clouds rolling in. If you are a tourist, you can get confused on where to go. I followed a girl, who shared a taxi with me. She led me to the old market, where you can get cheap woolens, cheaper outfits, and the cheapest umbrellas. Quick tip: If you are traveling to this part of India, do buy one of these because, in Darjeeling, you can get very cold at night. Plus, your clothes won’t dry easily in a cold weather, and it rains here frequently. I couldn’t concentrate because I heard someone playing guitar. I tiptoed to the reception desk, and there he was the receptionist Amrit. He asked me to join him, and then when I made myself comfortable on the sofa, we both started hitting notes together. I felt over-the-top happy because it was the first time in my life where I was in a strange place, with a complete stranger. Still, never in my life had I felt so free. 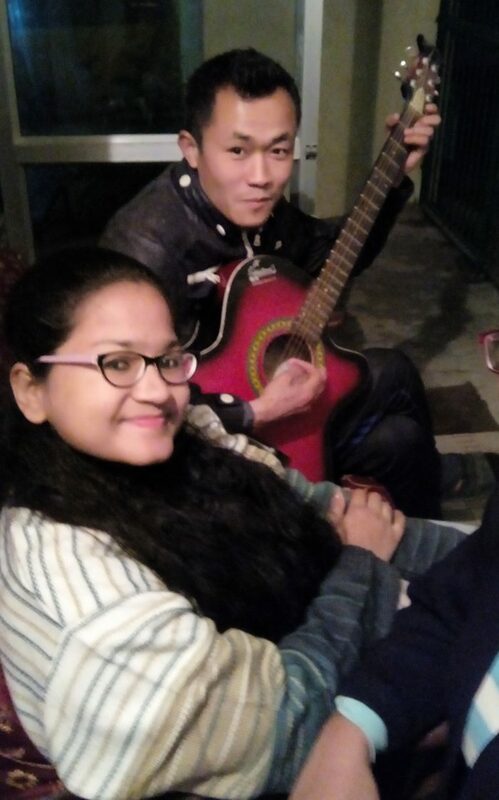 Our jamming session came to an end when his little angel daughter popped in and asked to go to bed. That was when we bade our goodbyes. But we promised to make a video of us jamming the next day. I had to sleep early because the next day was going to be interesting. 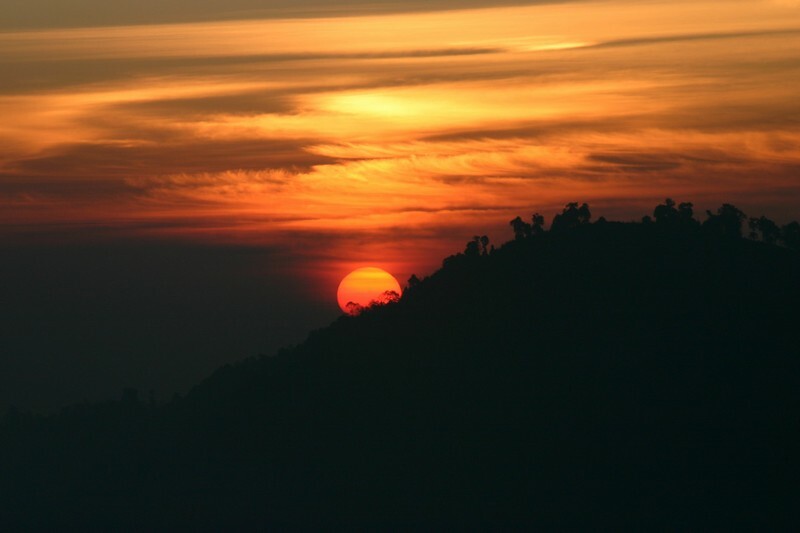 I was going to see the best scenery of Darjeeling, the sunrise at the Tiger Hills! I quickly filled my stomach with chicken and rice and turned off my bed lamp. The next day was going to be epic….wait for it… Dear Dairy! 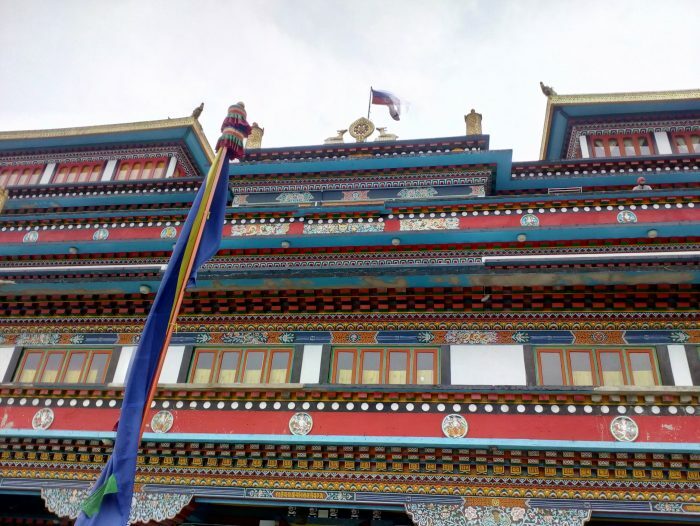 Read the first installment of my Darjeeling Travel Diary (Day 1 & Day 2). Trip reports and stories from The City of Hills.